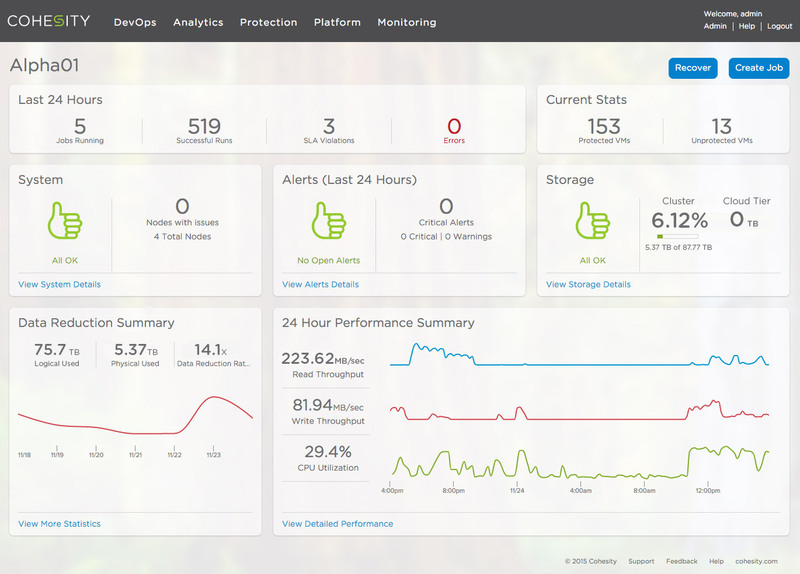 I’ve previously blogged about Cohesity‘s Data Platform here. I also had the good fortune to sit in on their presentation at SFD8 and got to mix with some of their product people that week. So I was pleased to hear news from Nick that Cohesity Data Platform 2.0 was ready to roll. 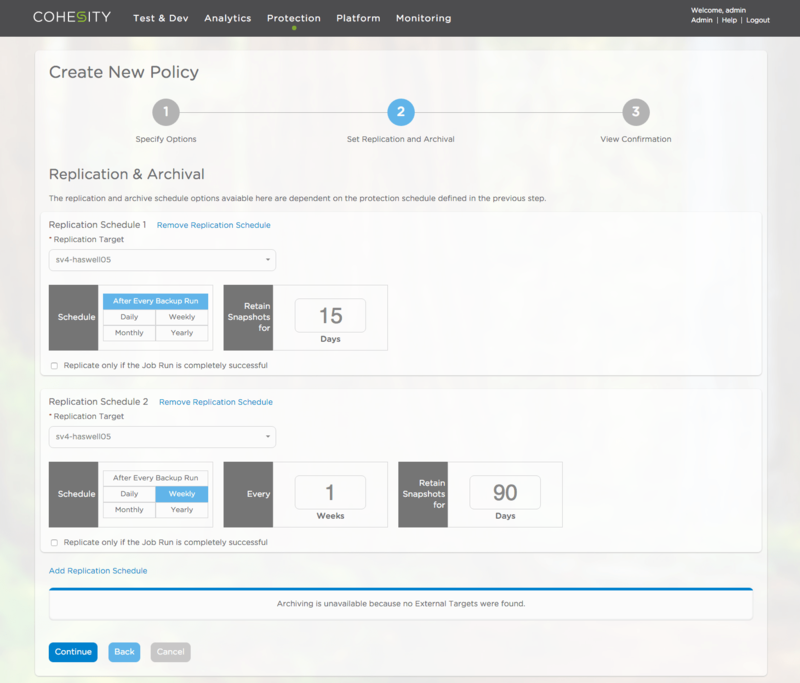 Site-to-Site Replication: Cohesity have introduced improved resiliency with the new capability for site-to-site replication between Cohesity Clusters. I’m looking forward to checking this one out in more depth. SMB Protocol: Support for SMB 3.0 – this is big, but no AD-integration yet (it’s coming, and part of a bigger RBAC push). Stronger Security: Hardware-accelerated AES 256-bit FIPS-compatible encryption – I knew a few people who’ll be excited about this. Automated VM Cloning for Test/Dev: To deliver a more streamlined test/dev workflow that repurposes backup data, automated cloning of backup VMs is now available to more quickly spin up zero-space clones. Cloud Enabled: A newly added public cloud archival tier enables spill over of the least used data to Google Cloud Storage Nearline, Microsoft Azure and Amazon S3, Glacier. Cohesity says that this will help in cutting on-premises storage costs. The cynic in me suggests that this will also increase your off-premises costs, but your mileage might vary. The UI has had a bit of touch-up, which is always nice. Nick provided me with a sample screenshot. There’s a cool video on YouTube that provides a good overview of the dashboard – you can see it here. Nick also said that they’ve modified “the data protection UI to now deal in profiles that are assigned policies. Jobs are still a thing that happen, but they happen as a result of policies attached to a profile, where the policy determines RPO/RTO, indexing, location, etc.” Here’s a screenshot of the Replication & Archival policy that can be attached to profiles. You can also see a video on managing policies for data protection here, and a clip on creating a protection job using policies here. Cohesity are doing a bit of tour around the US to let us know more about what they’re all about. You can sign up for a session here. Mohit Aron (the CEO) is the featured speaker, and I recommend getting along to listen to him if you can. I’ve been intrigued by Cohesity since they came out of stealth and I had the opportunity to talk to them in more depth late last year. I think the concept is interesting, and the execution technically has been really good from what I’ve seen. I’ve criticised them previously for some mixed messaging in the marketplace, but I put that down to the version 1 flavour of everything. That said, Cohesity are listening to customers, pundits, and the marketplace in general, and they’re actively developing features based on that feedback. If you’re looking for a different approach to “secondary storage” in general, I recommend having a chat to Cohesity about what they can do for you.